Quality Air Heating and Air Conditioning > Articles > Heating > Why Does My Furnace Smell Like Burning? If you use a furnace to heat your home, then you already know the many benefits of doing so. Furnaces are quite efficient, and their forced air heating method allows for the prompt heating of one’s home. What you need to remember, though, is that a furnace is still a mechanical system. As well-manufactured and maintained as yours may be, it is still possible that you’ll encounter problems with it at some point. When you do, it is always best to schedule immediate furnace repairs in Columbus, OH. This is true if you smell you a burning odor when heating your home. There are a few potential causes of this problem, and the only way to know for certain what the issue is is to hire a professional to assess the situation. One potential cause of your burning odor is an electrical problem with your system, and this can actually be quite dangerous. If there is a problem with the electrical wiring or components in a furnace, a fire is a very real risk. This is precisely why it is so important to have a burning odor investigate by a professional as soon as possible, whatever you may think the cause of the issue is. Overheating components may also be to blame. Your fan motor, for instance, may overheat if it has to work too hard in order to distribute heated air throughout your home. This may be the case if your vents have accidentally been blocked off or obstructed, or if your air filters are very clogged up. Don’t let this issue lead to system damages. Finally, let’s end on a best case scenario: dust. It is possible, if you notice a burning odor upon first running your system for the year, that dust is to blame. The burning odor may just be the smell of dust burning off of the dust burning off. If the issue persists, this is not likely the case, though. 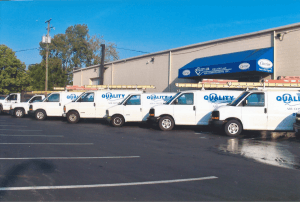 Call Quality Air Heating and Air Conditioning for quality furnace repairs.